Working as a Certified Nursing Assistant is a great first step to a career in patient care. The preparation for this profession is minimal compared to the time it takes to complete nursing school. CNA classes can be completed in 4 to 6 weeks depending on the schedule, which means you can begin a career in health with a small investment of time and money. Throughout the course of the program, you’ll learn how to measure vital signs, assist clients with personal hygiene, communicate with patients and their families, collaborate with members of the patient care team, observe patients and report concerns, care for wounds and catheters, and use basic nursing skills to ensure patient comfort. At a rate of 12 percent over the next decade, employment of nursing aides is projected to grow faster than the average for all occupations through the year 2026. 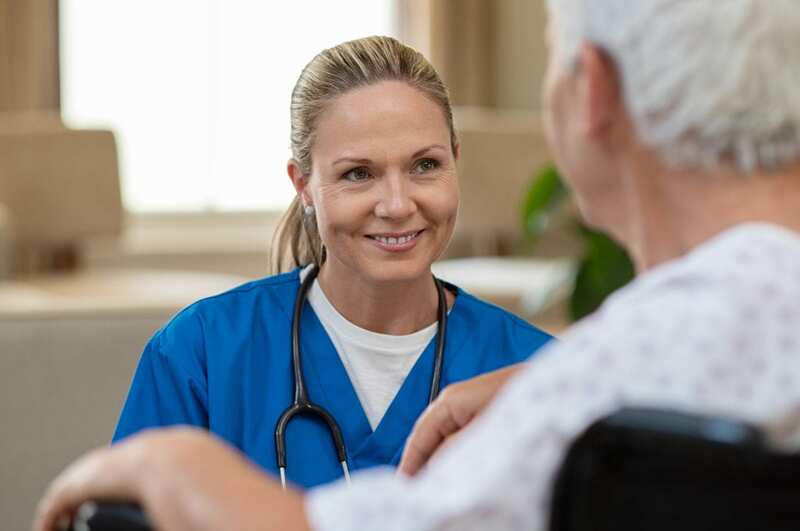 The growing demand for long-term care services among the aging population and the shift to outpatient care are the primary factors that drive demand for nurse aides. As more seniors settle into nursing homes or request care in their own homes, employment will explode in these settings. Nursing assistant graduates must apply to take and pass the Nurse Aide Assessment for Virginia Board of Nursing Certification before practicing a long-term care facility. CNAs must practice under the supervision of a licensed practical nurse, registered nurse or physician. The intensive nursing assistant program at Gee’s Career Training Institute is approved by the state board of nursing. The curriculum includes 130 hours of instruction: 60 hours in the classroom, 30 hours of hands-on training, and 40 hours of patient care activities in a skilled nursing facility. The high-quality training incorporates live demonstrations, video and computer based learning, and hands-on practice in a modern lab. Instructors will guide the development of basic nursing skills including measuring and recording vital signs, observation and reporting, infection control, making beds, personal care, catheter care, Alzheimer’s care, and rehabilitative treatments. A registered nurse instructor will direct students as the care for patients in a nursing facility. Students who successfully complete the requirements will be eligible to sit for the Nurse Aide Assessment to become a Certified Nursing Assistant. The school limits enrollment to 12 students with each cycle. Tuition costs $900 and includes books. The costs for criminal background check, CPR/FA, and liability insurance are additional. Student must purchase uniform, stethoscope, watch with a second hand, and blood pressure cuff for the clinical rotation. A flexible payment plan is offer for a cost of $50. Late payment will incur an interest rate of 15%. The Nurse Aide program at ASNAAH prepares adults for a career as a direct care professional. The program covers 135 contact hours of instruction: 95 hours of theory and 40 hours of clinical experience. Experienced nurse instructors will help students develop the skills to care for patients across the life span. Course topics will include personal care skills, basic nursing skills, patients rights, infection control, communication skills, patient safety, observation and reporting, and vital signs. Graduates will receive a Nurse Aide Certificate of Completion and will be eligible to take the Nurse Aide Assessment for certification by the Virginia Board of Nursing. They will understand the role and responsibilities of the Nurse Aide, patients’ rights, privacy, and confidentiality, the use of infection control measures to prevent the spread of disease, how to monitor clients’ condition, what to report to supervisors, and the prevention of client abuse, neglect, and abandonment. Enrollment is limited to 10 to 15 students with each cycle. The morning schedule will last 6 weeks and the evening schedule will be covered in 7 weeks. Tuition for the program is $800 for a limited time. QRG Nursing Academy hosts a nursing assistant program with the approval of the Virginia Board of Nursing. The curriculum covers 80 hours of classroom lectures and 40 hours of direct patient care activities in a real-world facility. Areas of study include medical terminology, infection control, nursing care over lifespan, anatomy and physiology, human growth and development, infection control, vital signs, role and responsibility of a nurse aide, communication and interpersonal skills, rehabilitative treatments, mental health, patient safety, patient rights and independence, nutrition, basic nursing skills, and hospice care. Use the contact information below to find out more about the class schedule and tuition. The comprehensive Nurse Aide program at First Career Center is approved by the Virginia State Board of Nursing. The curriculum adheres to the guidelines for nurse aide instruction and includes academics in the classroom, hands-on practice in the skills lab, and a clinical rotation in a skilled nursing facility. First Career Center offers experienced instructors, state of the art classrooms and lab, interactive lessons, and quality supervision during the clinical experience. Students will learn how to provide personal care, ensure patient safety, assist patients with mobility and transfer, report to supervisors, prevent falls, measure vital signs such as blood pressure, pulse rates, and temperature, and collaboration with other health care professionals. Classes meet Monday through Thursday from 8:00 am to 2:30 pm for the first three weeks and Monday through Thursday from 7:00 am to 3:30 pm for the final week. Tuition for the program is $900. The nursing assistant program at Care Perfections Health Services prepares students for a career in nursing. Classroom lectures and clinical rotations conform to the state’s guidelines for nurse aide education. Areas of study include basic nursing skills, medical terminology, nurse aide role and responsibilities, infection control, vital signs, range of motion exercises, rehabilitation techniques, communication and interpersonal skills, and patient safety. Care Perfections offers students convenient onsite testing for state certification. The duration of the program is 5 to 10 weeks depending on the schedule. Classes meet Mondays through Friday from 9:30 am to 2:30 pm for the 5-week schedule. The weekend class meets Saturdays and Sundays from 8:00 am to 4:0 pm for 10 weeks. Tuition for the program is $590. Additional expenses include stethoscope and blood pressure cuff, liability insurance, lab supplies, uniforms, application fee, and textbook. A free textbook, workbook, and uniform are available to enrolled students. A flexible payment plan is available for no extra cost. Excel Health Institute LLC prepares nurse aide students with the knowledge and skills to care for clients in nursing homes, assisted living facilities, home healthcare, and hospitals. Program graduates will receive a certificate of completion to be eligible to take the Nurse Aide exam for the Virginia State Board of Nursing Certification. Weekday and weekend schedules are available. Tuition for the program is $600. Other expenses include textbook, lab supplies, professional liability insurance, uniforms, blood pressure cuff, equipment, stethoscope, and administration fee. The Virginia State approved Nursing Assistant program at Ultimate Health School includes theory and practical experiences in the school’s lab as well as a healthcare facility. Students will learn basic nursing skills, personal care skills, communication and interpersonal skills, quality improvement, safety and emergency procedures, control of infection, patients’ rights, and hospice care. The curriculum covers 130 hours of theory and practical work. Full attendance of the classroom and clinical rotation is required to graduate from the program. The program prepares students for state certification and practice as a CNA in a few weeks. Persons interested in enrolling in the program can take their pick of morning and weekend schedules. Classes meet Monday through Friday from 9:00 am to 5:30 pm or Saturday and Sunday from 9:00 am to 5:30 pm. Tuition for the program is $600. Other costs for liability insurance, NACES fee, technology fee, uniform, and textbook are the student’s responsibility.